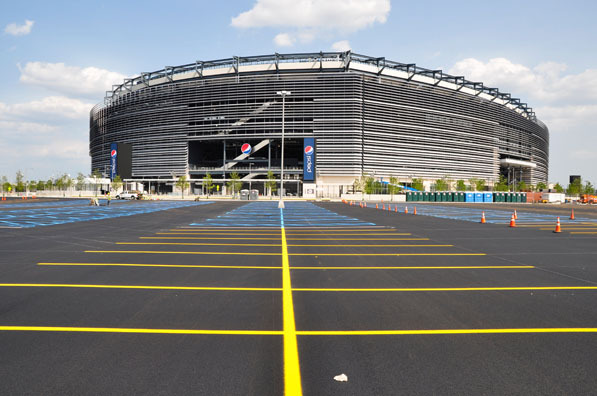 By diversifying its service offerings, Straight Edge Striping has grown enough to take on high-profile projects such as MetLife Stadium. Andrew Altobelli is an astute manager who’s willing to make the tough decisions to steer his striping company, Straight Edge Striping, through the shifts in the marketplace. So, when the decline in new construction began because of the recession, leaving Straight Edge Striping with fewer parking lot projects, Altobelli began looking for opportunities in other market sectors. Noting the increase in federal and state money directed toward infrastructure and road improvements, he channeled a large portion of his workforce into street and highway striping, and his firm has since been riding a wave of growth. Altobelli worked for a line-striping company through college and wanted to stay in the industry, so he fast-tracked his way through college. “I was very passionate about what I was doing at the time and did not want to be away from the business,” he says. He founded his own firm in 2000, and it has since expanded into a business of 43 employees—with plans to hire more. Comparatively, according to Altobelli, the average striping company has just 3–4 employees. Saleswise since 2000, the company’s annual earnings have jumped from $375,000 to $8 million, and it was even featured in 2007 in Entrepreneur’s “Hot 500: The Fastest-Growing Businesses in America” list. 1. Structure your company early for growth because you don’t know how fast you’re going to grow. 2. Have a plan. When you’re small, you may overlook some of the details needed to structure your company, which makes it hard to implement new practices later on. 3. Pay wages that reflect the value of your employees. They contribute to your success, so reward them accordingly. 4. Understand the marketplace and your competition. 5. Establish a company culture so your employees are working toward the goals of the company, not just their own. Working capital and logistics are the biggest challenges to leading a striping business. “We’ve spent well over $3 million in the last five years, and that is a huge undertaking for any company considered a small business,” Altobelli says, noting that the average cost of a new roadway-striping truck is $550,000. Straight Edge Striping also must adhere to very rigid timelines and will operate around the clock to finish projects—and it works in every construction sector it can, including housing, roadways and highways, airports, retail, schools, and hospitals. In 2011 the company completed striping for MetLife Stadium in Rutherford, New Jersey. The $500,000 project included striping for 30,000 parking spots, nearby state and township roads, and infrastructure improvements. Altobelli adds that because the project involved knocking down the old stadium and building a new one, the striping timeline was rigid and involved a tremendous amount of work in a short period.